New products are introduced into the market for use in the home every day, but how often do we stop and think about what impact these items may have on the safety of our families? 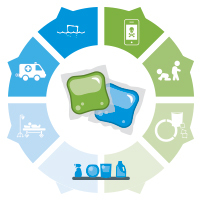 Since 2012 when liquid laundry packets began gaining traction in the market, more than 33,000 calls for children 5 and under have been reported to poison centers about children getting into liquid laundry packets. That’s more than 30 children every single day. The new packaging presents a need for new safety precautions when using and storing the product. Safe Kids is teaming up with Tide and Gain and their Up, Up and Away Program to educate families on proper storage of laundry packets in the home to help reduce the risk to children. We created an infographic to illustrate the risk and safety tips associated with laundry packet safety. Tide created this video to remind parents to keep liquid laundry detergent up and away, out of the reach of children. If a child gets into them, call the Poison Help number: 1-800-222-1222. You can download a tip card here. The solution to protect children in the home is making sure that parents and caregivers know how to prevent a serious incident, and what to do if help is needed. For more tips about keeping kids safe at home visit our home safety page.